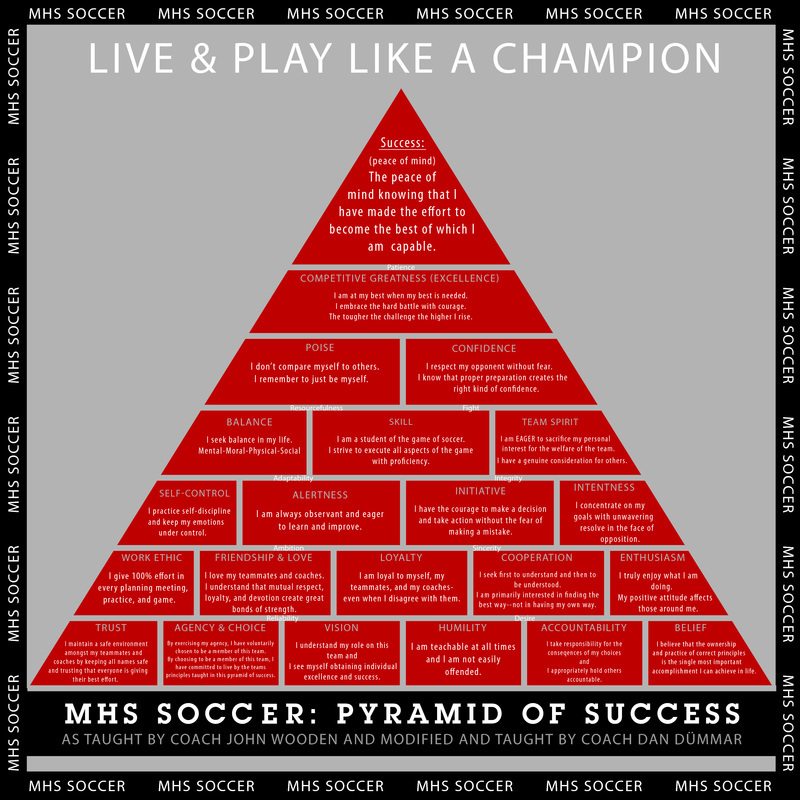 Madison High School Boy's Soccer (MHSBS) teaches its athletes a value system based upon the pyramid of success, as taught by Coach John Wooden and modified by Coach Dan Dümmar. Internalizing and living (buying completely into the program) the standards set forth in our pyramid of success is paramount to an athlete’s success in this program. The pyramid identifies and instills values such as how to make proper choices, develop trust, and promote cooperation, belief, accountability, loyalty, and hard work in order to be successful in a highly competitive and demanding environment. The lessons that these young men will learn will go far beyond soccer and will help them be able to accomplish hard things in life as they enter a fast paced, complex, and challenging world. MHSBS believes that our program inspires its athletes to live and play like champions by reaching success and excellence in life and on the field. We believe that developing an athlete’s passion for competitive soccer can be a driving force in motivating our youth to own (internalize and live) and exemplify the principles taught in our pyramid of success. The athletes striving to be on this team and compete at this level are required to make many physical, mental, emotional, and financial sacrifices. This program requires many resources to effectively compete at the 5A state level, to provide the highest-level experience, and to make a life-long impact upon these young men. These include coaching, volunteers, practice facilities (fields and maintenance, weight rooms), bus transportation costs, uniforms, hotel rooms and food, medical equipment and supplies, and quality equipment such as cones, poles, ladders, pennies, nets, moveable goals, lodging and food. The school does not give us any budget at all-not one penny. Anything and everything we buy (uniforms, balls, equipment, dinners, etc.) comes from money we either fundraise or charge to the athletes to play soccer. Each year there are also private donors that give to our program and we express our deep appreciation to those individuals and entities. Parents, we also appreciate your support in our pursuit of excellence and success. A. On Excellence and Success in Soccer: From the surface, the difference between how we view excellence and success or victory and defeat seems easy to identify. One team lost. The other team won. One team put more goals in the net than the other one. One team is happy and one team is sad. One team’s parents are frustrated with the coach or their child and the other team’s parents are thrilled with their coach or their child. One team is the winner. The other team is the loser. Now what . . . What meaning does this have? What lesson(s) have we individually learned from this event, team, or season? This is the challenge we face with you and your sons. We must re-train our minds. A paradigm shift needs to occur within each of us for us to truly reach our full potential. This must occur within each of us at an individual level. Until this paradigm shift occurs, we will continue to allow our feelings to be determined by things we cannot control (the referee’s, the weather, injuries, and perhaps bad or good luck). There is something higher and there is a better way. This better way is to come to understand what it means to Live and Play like a Champion. Let’s begin. C. What does it mean to reach success? The peace of mind knowing that I have made the effort to become the best of which I am capable–not the cheers from the fans or the championship banners. This means that you have the peace of mind knowing that you have never stopped striving in your individual journey to reach excellence. This comes over long periods of time. T. Alan Armstrong said “Champions do not become champions when they win the event, but in the hours, weeks, months and years they spend preparing for it. The victorious performance itself is merely the demonstration of their championship character (effort).” When you have made this type of preparation, you will have the right kind of pre-game confidence and you will know you have made the effort to become the best of which you are capable. D. Does this mean we are not interested in winning? One might mistakenly interpret this philosophy to mean that we are not interested in winning; that we will try really hard and if we don’t win, it’s okay. We will pat each other on the back and go get ice cream so we feel better. This would be a serious misunderstanding of this programs philosophy. We certainly want to win just as much as the next guy-but it is much more intense than that. We desire to compete at the highest level. The idea is that winning is not the primary focus. Winning is a myopic goal at best. What does it really produce? What does it really mean? The focus is on striving for and reaching excellence and success every day in practice and in each game. This involves a paradigm shift, both from the parents and the athletes, from what we currently view winning as (success) to instead focusing on our individual efforts and those things which we can control. Controllables are those things in soccer that we can control and improve as individual members of this team. For example, we must focus our efforts on improving our technical aspects of the game by becoming a better dribbler, a better passer, a more effective communicator, and a better shooter. We must also focus our efforts on our physical attributes by becoming faster, stronger, and more aggressive. We must also focus our efforts on our tactical understanding of the game and become students of the game. We must also focus our efforts more on our mental skills in order to achieve a peak performance. This means we have to train smarter, longer, harder, and more intense than any other individual and/or team. We must come to understand that our efforts start and end with the word “I”. There is an “I” in team. It is in every player on the team. It is in fact the essence of the word team. There would be no team without the individual players that make up the team. Everything one does on this team starts as an individual exercise. For example, no matter what anyone else hopes or prays for they cannot control whether someone else passes, dribbles, or shoots well. Because no one can control anyone else on the team except for themselves, each one of us must be individually accountable for what we do on and off the field. When each one of us individually reaches success and excellence then the spirit of the team will come alive and the spirit of the team will take on a life of it’s own. This team spirit can produce fruits much greater than our individual efforts. Being a part of this type of team is truly a special thing. However, this will not happen until we first understand and own the principle of individual accountability. We cannot truly have team spirit without truly owning the principle of individual accountability. Truly Living and Playing like a Champion requires a much higher commitment and constant effort (physically, mentally, emotionally, and financially) than individuals and teams who play simply to win. It means individually making the effort every single day to become the best of which we are capable. (1) Can we have victory in victory? This is one way we can reach success and excellence. The byproduct is that we also win the match. (2) Can we have victory in defeat? Yes we can. If so, how? Have we given our maximum effort every day (throughout the off-season, pre-season, and regular season) to prepare, train, and become our very best? Did we give our very best in the practice? Did we give our very best in the game? If so, then regardless of the score in any particular game, we should be able to have the peace of mind in knowing that we have reached success and we can have victory in defeat. This doesn’t mean that the defeat will not sting. Of course it will. But it will be better understood and will motivate us to work harder on those things we can control to improve our game. (3) Can we have defeat in victory? If we have not given our maximum effort every day, then we have sold ourselves short. The fact that we have won a game or a banner is irrelevant. What we have really lost sight of is the most important objective. We have not reached excellence or success. We have not lived nor played like a champion. A win, in and of itself, does not have real significance. It is a hollow victory. What really matters is our individual effort at every planning meeting, every practice, and every game-both during the season and off-season. (4) Can we have tragedy in defeat? If we have not given our maximum effort every day, then we experience tragedy in defeat. This occurs because we know what we are capable of and we are haunted by the belief that what we could have accomplished more. We did not give the full effort. Due to our own choices, we have not reached our full potential. Most of the time, one of the byproducts of individually striving to reach excellence and success will be that we will win our games. Winning then is a by-product of our individual efforts-not the end goal itself. However, regardless of the game result, it is the individual effort in striving for excellence and success that is most important. Knowing that you have made the effort to become the best of what you individually are capable of is what it means to reach success. The principles taught in the MHS Pyramid of Success remind us of what this effort requires. When you really understand this, you come to understand what it means to Live and Play like a Champion.